Can a Foam Mattresses Help With Snoring? We all know the importance of getting a good night’s sleep. We also know that snoring is the gift that keeps on giving. When you suffer from snoring, you might be inadvertently interfering with the sleep of your spouse. While the person snoring is likely unbothered by their own sounds, their bedmate can lose sleep and experience poor quality of sleep which in turn impacts their quality of life during waking hours. Many restless sleepers have turned to foam in hopes of solving the common problem of snoring. So, can foam mattresses help with snoring? Let’s take a closer look to get some answers. A memory foam mattress molds to all the contours of your body, giving your neck, shoulders, back, and legs proper support. Mouth anatomy. If you have a thick soft palate, it can narrow the airway and increase the chances of snoring. Another anatomy aspect which increases snoring is having an elongated uvula (the small ball of tissue which hangs in the back of your mouth in the throat) which can increase the vibration of air as it passes through the airway during sleep. Alcohol consumption. Since alcohol relaxes the throat muscles, it can lead to an increase in snoring if you consume it prior to bedtime. Sleep deprivation. If you go a few nights without getting enough sleep, when you finally crash, your throat will be more relaxed than usual while you sleep. This is a common reason people snore. Body Position. Certain sleeping positions can cause snoring in an otherwise non-snorer or worsen the snoring of snorer. For instance, sleeping on your back will cause the loudest snoring since gravity affects the throat and narrows the airway. Can foam mattresses help with snoring? When looking at the common factors that lead to snoring, there are a few ways a foam mattress could help. If you are looking for a mattress to solve all your snoring problems and rid your night of snoring complete, you will be disappointed. For those without a diagnosed sleep disorder or nasal condition, getting snoring under control is usually found in managing the above-mentioned causes with the exception of mouth anatomy which is out of your control. This isn’t to say foam mattresses can’t be used to help you manage those causes (other than cutting back on alcohol consumption prior to bed) to the best of your ability. Let’s take a closer look at the many benefits of foam mattresses. The use of foam mattresses most closely impacts body position and sleep deprivation caused snoring. Body positioning. Foam is an exceptionally comfortable sleep option which can help with body positioning. Depending on the foam you choose, the mattress can be extra firm for added support or extra cushioned for added softness. Since foam lets you choose between a firm mattress or a softer one to meet your preferences, you will be able to achieve a comfortable body position while sleeping on your side to reduce snoring. There are also foam mattresses which allow you to stay slightly elevated during sleep which lessens the effect of gravity on the throat to reduce or eliminate snoring. Sleep deprivation. When snoring is caused by sleep deprivation, the culprit might just be a bad mattress interfering with your sleep quantity or sleep quality. A foam mattress can give you improved comfort at night over coiled or spring mattresses for those who prefer a softer, more cushioned mattress. Foam can also be a bit more breathable which helps to keep you cool at night for better sleep quality. There is some debate that a memory foam mattress is better for those looking to reduce or eliminate snoring than other foams on the market. While foam, in general, is a great solution, there are a few unique benefits of memory foam for those who suffer from snoring. Better support and cushioning. 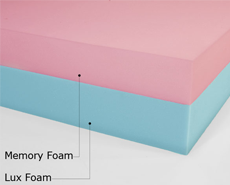 Memory foam offers an impressive cushioning softness balanced with supportive firmness which can be hard to achieve without some compromise on one or the other in other foam types. The support and cushioning may allow you to get comfortable enough to settle in for a long, uninterrupted night of sleep which can reduce sleep deprivation related snoring. Easier to sleep on your side. Thanks to the overall impressive comfort of a memory foam mattress, it is easier to sleep on your side instead of your back which will help reduce snoring caused by body positioning. Contours to the body. A memory foam mattress also contours to the body while relieving pressure from pressure points in the body. This may help you get the restful night of sleep you deserve while allowing you more comfort while sleeping on your side.